How to get there: We drove north on the main road (Hwy 82) from central Aspen for about 10 km to the turnoff (left) to the ski resort Snowmass Village (cannot be missed, clear signs and a stop light). Follow this road as it turns into Brush Creek road (stay right) for a bit more than 8 km and take a right a Divide Road (there is a good street sign). After approximately 1.5 km this road has a parking lot on its right and a lodge entrance going left, while there is a dirt road going straight. Take the dirt road, it has a sign saying "drive on your own risk". This road zig-zags down a ski slope. It is rough, but passable for ordinary cars. At the bottom of the hill, an alternative road comes from your right, go straight and find the Snowmass Trail parking area very shortly thereafter. The trail starts out just left of a ranch entrance, the first part of the trail crosses private land and you pass 3 gates that should be kept closed. Before the third gate, there is a trail going sharply right. This trail crosses the Snowmass Creek and is called West Snowmass Trail. It can be used to access Capitol Peak. Do not take that trail, but continue straight along the Maroon-Snowmass Trail. This trail follows the creek (on the left side) up a very nice valley. After about 5 km, the trail starts climbing (left) and there is a nice view into a side valley, drained by Bear Creek. Higher up, one can see Snowmass Mountain to the south-west at the end of this valley. The trail continues along the east (left) side of Snowmass Creek, the valley is quite narrow here and climbing. Later, the trail becomes level, the valley opens up, the basin ahead with meadows and forest forms a truly beautiful wilderness landscape. A small lake on the right, then a slightly larger lake. The trail crosses Snowmass Creek just before this lake. This point is about 10 km from the trailhead. 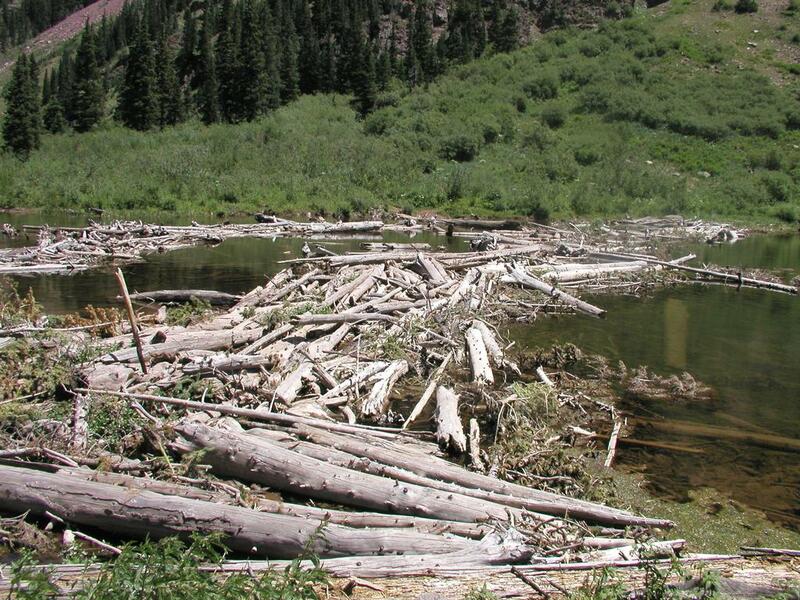 (GPS coordinates, North:39.08.068, West:107.00.787) At the outlet end of the lake there is a "logjam", several logs forming a slightly complex bridge. It is strongly recommended to pick up a sturdy pole to help balance across. Some logs are not jammed and rolls, some are so saturated by water that they sink under if stepped upon, while a few are quite good to walk on. The trick is to find the good ones. We crossed without any incidents. The trail continues on the west (right) side of the lake and crosses a meadow, then climbs the hill to a new plateau where the trails to Trail Rider Pass and Maroon Lake are indicated on a sign. There is one final hill as the trail follows the Snowmass Creek up to Snowmass Lake. Several good campsites are scattered among the trees near the lake just south (that is across) of the creek. There is a distinct, but fairly small trail along the east side of Snowmass Lake that can be followed around the south end of the lake. The trail, quite well marked with cairns then continues diagonally up and across the lower part of the steep scree slope that is above the south-west end of the lake. This line takes you across rocks and boulders that are quite stable and provide for easy hiking. Follow this trail as it reaches a line of vegetation on the right side of the scree slope. The trail now heads straight uphill with a distinct gully on its right side. Higher up one can either continue straight up on loose scree or cross a small stream to the right (the crossing is marked with two cairns) if the rock is not too slippery (wet). The trail on the other side of the small stream is easier. The terrain levels off. The area from the top of the scree slope and all the way to Snowmass Mountain is supposed to be one of Colorado's largest permanent snowfields. However, on our trip there was absolutely no snow left, all melted away already before mid July! Snowmass Mountain (GPS coordinates, North:39.07.124, West:107.03.988) is the highest point on a ridge that encloses this high basin. 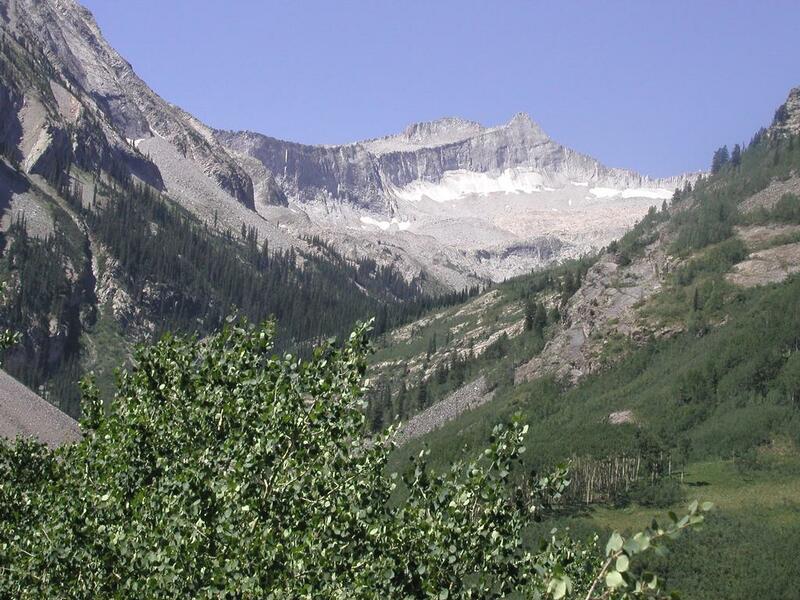 To the left (south) Snowmass Peak and Hagermann Mountain forms a high part of this ridge. From Hagermann the ridge drops to a distinct saddle, then the ridge forms a distinct hump about halfway to the Snowmass summit, further north there is a small, but distinct subpeak called North Snowmass before the ridge turns back towards the north end of Snowmass Lake. There is a broad, very distinct ramp leading up to the hump that is about half way between the low Hagermann saddle and the Snowmass summit. Hike straight up this ramp staying south (left) of some steeper cliffs. This climb is largely class 2, towards the end class 2+ unless wasting too much time trying to find the absolutely easiest way up. As soon as you are on the ridge, the route follows the ridge to the summit. 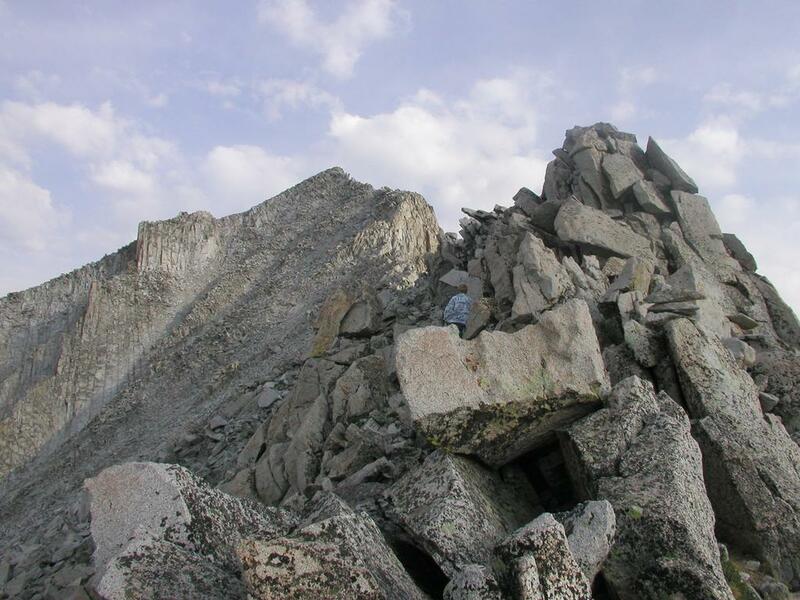 There are several variations, one can stay on the very top of the ridge almost the entire way, this involves class 3 scrambling and some exposure. In most places, one can find an easier route by staying left (west) of the main ridge. 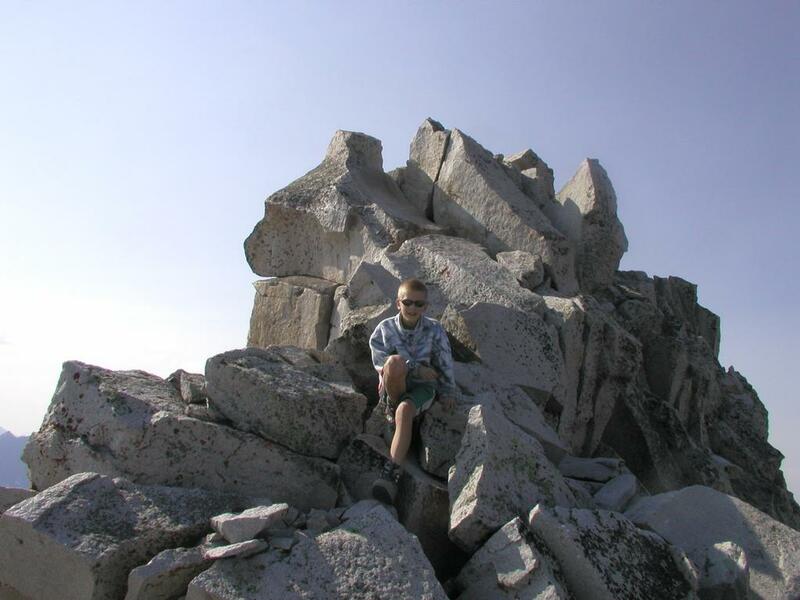 The summit is quite nice, the very highest point is a single rock, perhaps 1.5 meter tall. We continued along the ridge, staying high (YDS class 3) and found an easy way directly down to the lowest col between Snowmass Mountain and its northern subpeak. From this col there is a gentle slope down back into the basin. 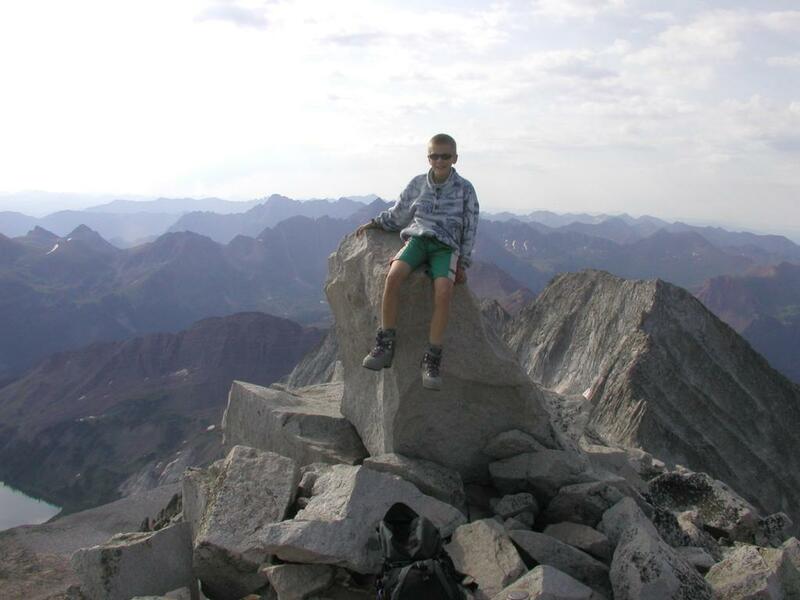 Thus, one can actually climb Snowmass Mountain by ascending its high ridge either south or north of the summit. 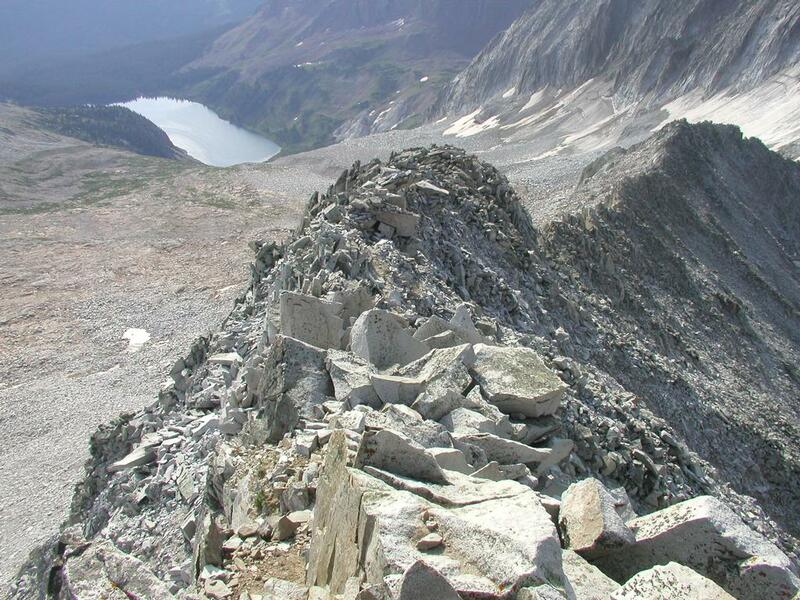 Both alternatives involve some class 3 scrambling along the ridge. The easiest route is likely from the south and staying mostly off on the west (left) side of the ridge itself. I did this climb with my son Pål Jørgen, age 13. We hiked in to Snowmass Lake the day before in 4.5 hours. Started the next morning at 0550, reached the summit at 0845. We spent half an hour on the summit with blue sky and good visibility. 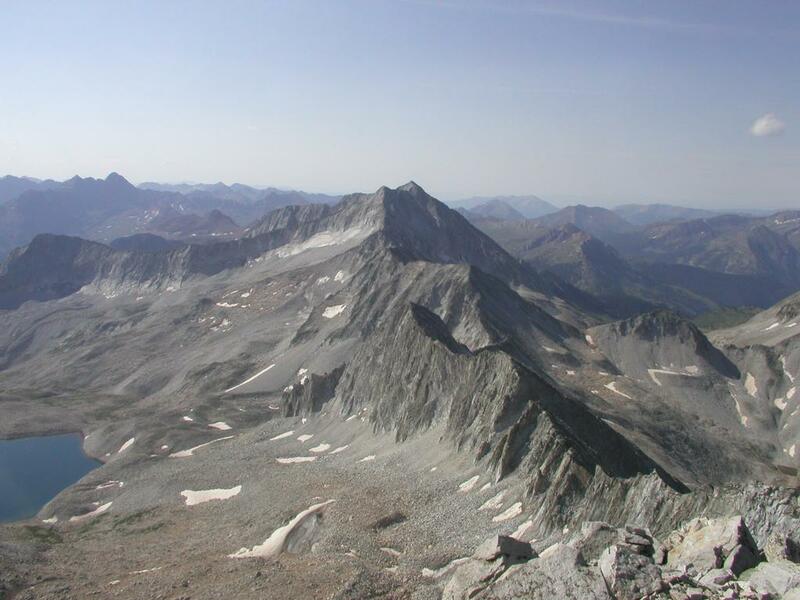 We continued to traverse the summit ridge at 0915 and returned to our tent at 1130. We left Snowmass Lake at 1230 and were back at the car at 1600 after a 3.5 hour hike. Snowmass Mountainas seen from the trail. 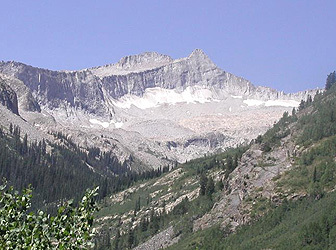 Snowmass Mountain with the connecting ridge as seen from Capitol Peak. Snowmass Lake seen from Snowmass Mountain. On the ridge of Snowmass Mountain. The summit of Snowmass Mountainis well defined. The traverse took us across here.